Contrary to the above the Royal Naval Beach Commandos had the job of staying on the beach and keeping the beach open from the initial assault for as long as it was needed. From 'Operation Ironclad' in May 1942 to 'Operation Zipper' in September 1945 the Royal Naval Beach Commandos landed in the first waves of amphibious assaults, marking the limits of the beachheads, clearing enemy positions if necessary, directing and mooring incoming landing craft, preventing bottlenecks and maximising the flow of personnel, vehicles and supplies across the beach, removing mines and underwater obstructions, taping safe passage routes off the beaches, aiding the evacuation of the wounded, informing subsequent waves of important intelligence about the enemy strengths and positions, helping the 'Brigade Group' set up ammunition and supply dumps, supervising enemy prisoners and being available to tackle any task required of them including acting as a rearguard if necessary. On major operations the RN Beach Commandos were part of the naval 'Assault Forces' and each Royal Naval Commando were responsible for a brigade front section of beach, however they were attached to and would train with the army Beach Groups supporting the 'Assault Brigades'. The Beach Groups were also known as Beach Bricks or Brigade Bricks, each was a composite logistics unit based around an infantry battalion (or equivalent sized unit) designed to maintain a brigade ashore for four days with specialist troops, including anti-aircraft artillery for it's own defence, military police, medical and signals sections, similar to the present day Royal Marine Commando Logistics Regiment. A 1943 film made prior to Operation Husky for training purposes entitled 'Combined Operations; Beach Organisation' can be streamed from the IWM website. At a meeting at Combined Operations Headquarters in December 1941, with the prospect of future amphibious operations becoming in Churchill's words 'armoured irruptions' requiring larger and properly designed landing craft carrying more men, guns and even tanks and other armoured vehicles, requiring a specially trained naval beach organisation, it was decided that eight brigade-front naval beach parties would be needed by the end of 1942. As part of the 'Special Service' Brigade within Combined Operations, which oversaw the Army Commandos they were initially called Naval Beach Parties (with the abbreviation N.B.P.) Each unit initially had an established strength of ten officers and forty eight other ranks divided into three sub-sections each known as a party. The units were designated by letters rather than numbers and the three sub-sections or parties were numbered one to three. For example for Charlie N.B.P. the three subsections or parties would have been C1, C2 and C3. Each sub-section or party had nineteen men each, one beach master (BM), two assistant beach masters (ABM) and sixteen ratings. In turn the three parties that formed the unit came under the command of a Principal Beach Master (PBM) who was a Lieutenant Commander. The PBM worked in close liaison with the Principal Military Landing Officer who was his army equivalent and reported to the Senior Naval Officer Landing (SNOL) who was responsible to the force commander. By the latter half of 1942 Combined Operations Headquarters had determined that they would need at least 20 trained beach organisations and they would need their own training establishment and by November 1942 the first unit NBP Mike was being formed at HMS Armadillo. Another problem would be getting the required number of volunteers especially officers to man all these extra units. Unfortunately Naval Beach Party sounded too much like "working party". Vice Admiral Lord Mountbatten understood this and that what was needed was a name with front line fighting status. 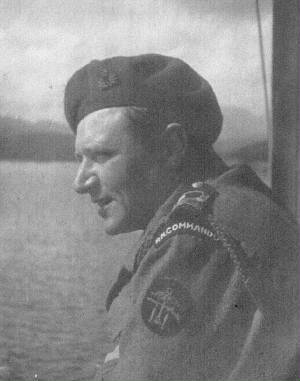 He therefore approached Brigadier Laycock who commanded the Special Service Brigade, which the Naval Beach Parties were part of at that time and suggested they be called commandos. Laycock's reply was that they considered themselves extremely honoured that the Naval Beach Parties should wish to be called commandos, as "they have got about the toughest job of the lot, and I for my part am glad I do not have to do it". Later Mountbatten wrote "the success of an operation largely depends on the speed and efficiency with which the (RN Beach) commandos get their beaches organised to receive the force to be landed" (from pages 39, 46-47 and 55 of The Beachhead Commandos by A. Cecil Hampshire). So the Naval Beach Parties were renamed Royal Naval Beach Commandos by order of the Chief of Combined Operations Vice Admiral Lord Mountbatten. It was also thought that the unit should when deployed be part of a force such as "Force V" that landed the Canadians in Sicily, as this would look better on an officer's record, looking less like shore duty. Even so some men were volunteered! In December 1942 the established strength or complement of a RN Beach Commando unit was increased and set at ten officers and sixty six other ranks giving each of the three sub-section or parties a total strength of twenty five made up of three officers, a Beach Master and two Assistant Beach Masters and twenty two ratings. The twenty two ratings in each party being laid down as one petty officer, two leading seaman, six able seaman and thirteen ordinary seaman(Page 59 The Beachhead Commandos by A. Cecil Hampshire and page 40 Beachhead Assault by David Lee). By April 1943 though Combined Operations had again increased the established strength of the RN Beach Commando as shown in the Combined Operations pamphlet No. 17. In the pamphlet each unit is shown as consisting of a PBM with an Assistant PBM and an Ordinary Seaman plus three sub-sections or parties of three officers and twenty four ratings. The twenty four ratings being made up of two Petty Officers, two Leading Seaman, six Able Seaman and fourteen Ordinary Seaman. On operations however the numbers and make up of the units could often be quite different. At their peak between October 1943 and September 1944 there were twenty one Royal Naval Beach Commandos each designated a letter from A to W, excluding B for Baker (which existed only on paper, though for some time) and I for Item which was not used at all. In addition Z for Zebra was allocated to a (second) unit to be formed at HMS Saunders, Kabrit, Suez but it was never operational and was absorbed into Royal Naval Beach Commando Dog. The names of the units were taken from the US Military phonetic alphabet of the time . The Royal Naval Beach Commandos were also known as Beachhead Commandos but more commonly the "Beach" was dropped and they were called Royal Naval Commandos though this is also a generic term that could apply equally to other Royal Naval units that were commando trained and men from the Royal Navy who served in Commando units like 14 'Arctic' Commando. This was reflected in the the fact that the Royal Naval Commando Association (disbanded in 2003) also welcomed men from the Royal Naval Beach Signals, the Landing Craft Obstacle Clearance Units, the Combined Operations Bombardment Units and the Levant Schooner Flotilla. By late 1945 however all the units had been disbanded except for Royal Naval Beach Commando Jig which was designated a Naval Beach Control Party in 1948, at which time it was also being proposed they be merged with the Landing Craft Recovery Unit and the Landing Craft Obstruction Clearance Unit. Eventually though the role was transferred to the Royal Marines and is carried out by Royal Marine Commandos of the Amphibious Beach Units within the Royal Marine Assault Squadrons. It is not surprising therefore the same unit can be referred to in a number of different ways, for example Naval Beach Party N, Naval Beach Commando N, Royal Naval Beach Commando N, Royal Naval Commando N, Beachhead Commando N, RN Commando N, N Commando, Nan Commando etc. If you are interested in the RN Commandos please join the The Facebook group using the link above, the group has over one hundred members. If you are not already a member of Facebook and want to join the group I suggest you create a basic profile with the minimum of information necessary and the maximum of security. Should you not wish to join Facebook there is a guestbook below where you may leave a comment reference the RN Commando webpages. Some Highlights on the Website! This link is to an audio recording of Commander Jim Speed DSC RAN, formerly Lt Speed RNVR of R Royal Naval Beach Commando speaking at a meeting of the Naval Historical Society of Australia on the 25th of August 2014, recording is an AIFF file of about 730mb and last a little over 45 minutes. In this recording Jim Speed talks about his time in the RN Commandos and being in the first wave on Sword Beach, June 6th 1944. Special thanks to Mr and Mrs J Speed for giving permission to publish the audio recording of Jim's presentation and R Smallman for acting as intermediary and obtaining said permission. 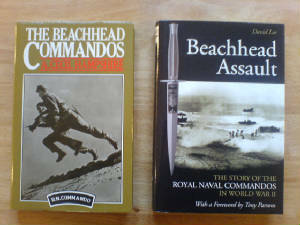 There are two books specifically about the Royal Naval Beach Commandos the first was The Beachhead Commandos by a Cecil Hampshire, published by William Kimber & Co Ltd in 1983 and the more recent Beachhead Assault by David Lee, published By Greenhill Books in October 2004 and though they are on the same subject they complement each other well. David Lee also wrote a short article entitled Royal Naval Commandos in World War II and there is another by Syd Kipling who served in Royal Naval Commando N from 1943 to 1945 Royal Naval Commandos. There are three other websites that will be of particular interest to those researching the Royal Naval Commandos the first is that of the Commando Veterans Association also there is the RAF Beach Units and last but no means least is the Combined Operations website. Three books well worth reading for background knowledge are; The Struggle For Europe by Chester Wilmot, though first published in 1952 it is still probably the best single volume history of World War II in Western Europe. The second is The Watery Maze by Bernard Ferguson first published in 1961 which records the story of Combined Operations of which the Naval Commandos were a part. The third is Amphibious Assault edited by Tristan Lovering MBE, originally compiled for the Royal Marines, the book takes a detailed look at amphibious warfare throughout the 20th Century. The following three shore establishments may appear in the personal records of those who were in Combined Operations units in World War II. HMS Quebec was part of No.1 Combined Operations Training Centre at Inveraray, HMS Quebec was commissioned on the 15th of October 1940 and paid off on the 1st of July 1946. From the late seventies to the late nineties there was a Combined Operations Museum located within the grounds of Inveraray Castle. HMS Copra was the Combined Operations Pay and Drafting Office, originally based at Chelsea Court SW7, commissioned on the 30th of August 1943 and paid off on the 30th of June 1946. COPRA was an abbreviation for Combined Operations Personnel Records & Accounts. The Drafting Section moved to Southend before relocating to Largs by the 5th of October 1945 whilst the Pay Section had moved to Largs by August 1944. The personnel themselves would of been serving elsewhere. COPRA supported personnel from all three services involved in combined operations in North Africa, Italy, and Western Europe etc. HMS Pembroke IV was a Royal Naval Accounting Base at Chatham and was paid off on the 30th of June 1946. HMS Armadillo was a Combined Operations Camp at Loch Long, Glenfinart used as a training and administrative base by the Royal Naval Beach Commandos, it was commissioned on the 25th of November 1942 and paid off on the 30th of September 1945. Achnacarry was the Combined Operations Commando Training Centre during the Second World War. There are two exceptional books that describe the training and development of the Commandos, they are "Castle Commando" by Donald Gilchrist and "It had to be Tough" by James Dunning. The Spean Bridge Hotel Commando Museum near Achnacarry is a small treasure trove for those interested in the history of the commandos. HMS King Alfred was a Royal Naval Training Establishment at Hove Battery, Brighton & Hove, between April 1940 and the the 7th of January 1946. Primarily for Royal Navy Volunteer Reserve Officer training. HMS Saunders was the Combined Training Centre, Middle East at Kabret by the Little Bitter Lake on the Suez Canal. Cocanada was the location of a Combined Training Centre (CTC) on the west coast of India. HMS Dundonald I at Troon was the primary holding and training base for RN Beach Signal Sections. HMS Dundonald II was where signalling procedures were developed, taught and put into practice in communications training exercises to and from landing craft. HMS Dorlin centred on Dorlin House is where the RN Beach Signal Sections personnel carried out their battle training overseen by an Army Commando training team. Signals training was also undertaken at HMS Saunders the Combined Training Centre in the Middle East. Nominal of Personnel in Major Landing Craft returning to the United Kingdom, including RNBSS7 and RNBSS9 as of the 11th of December 1943. The following items were donated by A. Thomas formerly of N and D commandos. The aim of these these web pages is to collate as much as possible of their history still held by individuals and organisations for all those who may be interested. This is particularly important for the RN Beach Commandos because the majority of the records pertaining to them were incinerated in a 'monumental spring clean' at their base HMS Armadillo just before it was decommissioned in 1945. Please note this web page and the associated web pages are not “official” and do not represent any official group or organization. Also please accept my apologies for piggy backing on a web site concerned with a separate subject "but needs must".